He found the House of Isis, Mistress of the Pyramid, by the side of the cavity of the Sphinx, on the north-west side of the House of Osiris, Lord of Rostaw, and he built his pyramid beside the temple of this Goddess, and he built a pyramid for the King's Daughter, Henut-sen, beside this temple. Maspero translates this as "by the side of the cavity of the Sphinx" whereas Breasted says it is "beside the house of the Sphinx". He found the House of Isis, Mistress of the Pyramid, beside the house of the Sphinx, on the north-west side of the House of Osiris, Lord of Rostaw, and he built his pyramid beside the temple of this Goddess, and he built a pyramid for the King's Daughter, Henut-sen, beside this temple. With this translation the VT would therefore be the "House of Isis" and the Sphinx Temple the "House of Osiris" with the Sphinx being north west of the VT. All things considered, this is exactly what we see without having to invoke structures in places of which there is no evidence for. The Inventory Stela was written in the Saite Period and at best, as per Petrie, copied from an MK original. The greatest value of this document is that the DE themselves after the fact accepted the structures predated Khufu building any pyramid. 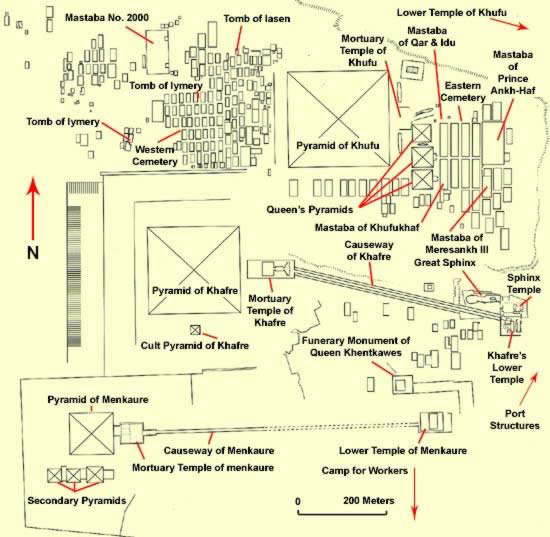 "...several of the mastabas constructed under Kheops, around the pyramid, contain in the masonry fragments of stone belonging to more ancient structures. Those which I saw bore carvings of the same style as those beautiful mastabas of Dahshur". If correct, these mastabas would likely therefore date to the early 4th Dynasty. Edited 3 time(s). Last edit at 14-Jun-18 15:26 by Thanos5150.